Here's the scenario: you are trying to fix a relative's network issues and you need to access their router's browser interface. We've all been there, fruitlessly pecking in combinations of 192.168.x.x. Unless you have every default router address tattooed on your forearm, you'll eventually encounter one that stumps you. When that happens, you can typically find the information with a simple command on Windows. Open the command prompt (Start > Run/Search for cmd) and then enter ipconfig. The address you need should be next to Default Gateway under your Local Area Connection, and it will often begin with 192.168. 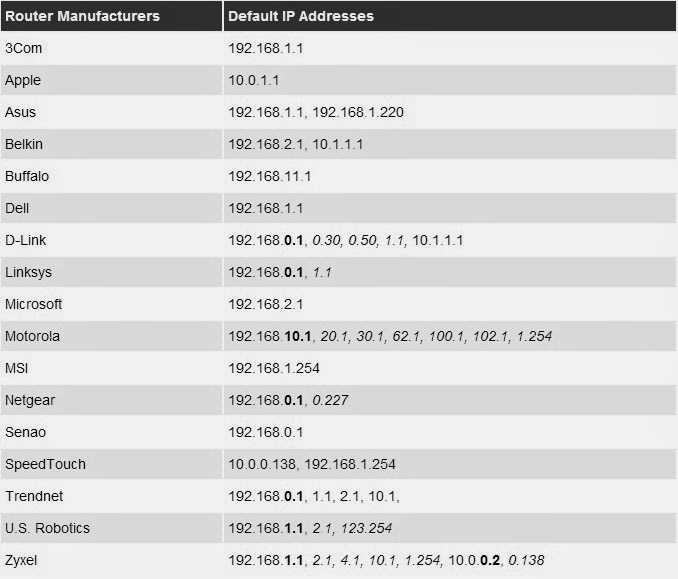 If for any reason you can't retrieve the router's IP address using that method, we've compiled a brief list of popular router brands and their common default addresses. Feel free to recommend additional addresses in the comments and we'll add the information here as a handy reference resource for members. If you're looking for an equally handy default username and password list, this PDF has tons of information for just about every router manufacturer out there. Common default usernames include variations of admin (Admin, administrator, etc. ), and the password is often admin, password, or simply left blank -- needless to say, it's good practice to change these upon setup..
வைரஸ் தாக்கிய ‘பென்ட்ரைவ்’ இலிருந்து பைல்களை மீட்க சிம்பிள் வழி! Copyright © 2013, PC-Friend.tk All rights reserved.. Awesome Inc. theme. Powered by Blogger.